SHARE Waiting 20 Years For The Right Car: Would You Do It? Waiting 20 Years For The Right Car: Would You Do It? I think anyone who has ever even dabbled in modifying or building a car knows that you need at least some amount of patience in order to get things done properly. And often, your patience is required from the get go. 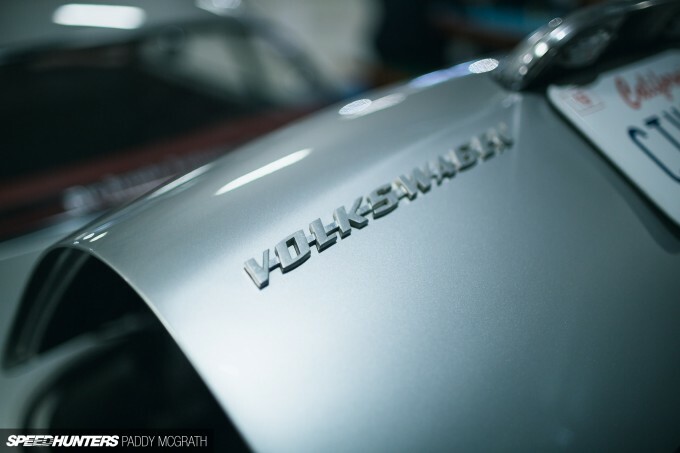 From the moment you’ve chosen the car – or indeed the moment the car chose you – you begin a long and arduous journey that only other car folk will ever understand or appreciate. 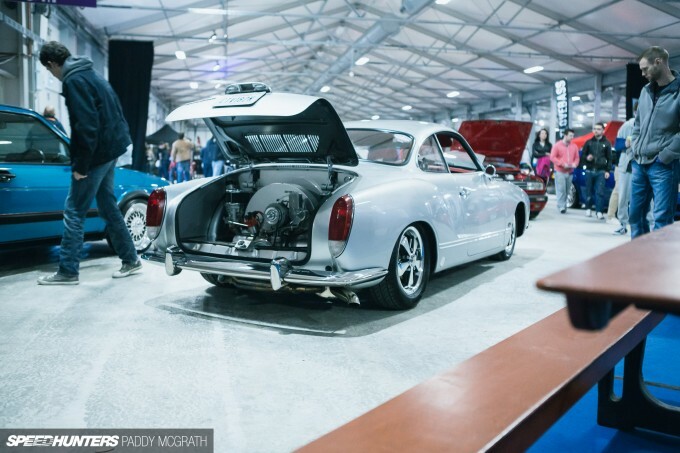 20 years ago, Matt Donnelly from Northern Ireland knew exactly the car he wanted to build and own one day: a California-Look Volkswagen Karmann Ghia in silver and with a red leather interior. It had to be left-hand drive too, as a right-hand drive car would, in his opinion, fall short of the Cal-Look he required. Just what exactly is the Cal-Look? I’ll let my friend Stephen Brooks show you in this short documentary he put together called Older N’ Faster. It’s definitely worth the 12 minutes or so of your time. For two decades Matt waited for just the right car to come along, before it reached a point where he would have known that he had no choice but to build his own. 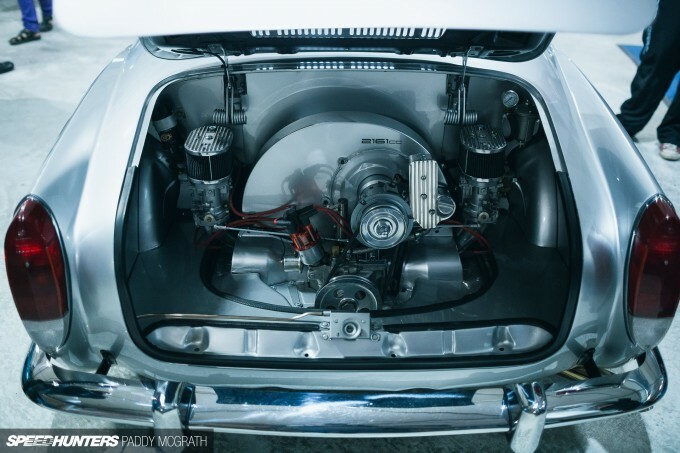 In late 2013, Matt came across a front damaged ’72 Karmann Ghia which had originally been imported from San Bruno in California. Well, you’re not going to get much more authentic than that for a base to build your Cal-Look car. The car was the wrong colour, had no engine, no wheels and a black interior. Other than that though, it was the perfect base for Matt to put a 20-year wait behind him and finally build the car of his dreams. Today, one of the most striking aspects is the custom silver colour that Matt created and applied himself. Where most metallic silvers have a certain amount of, er, metallic and glitter under direct light, Matt’s hue almost turns a flat pale shade. It is an exquisite colour that’s incredibly hard to capture accurately in either words or photographs. The show-stopping part of the car however lives in the rear. 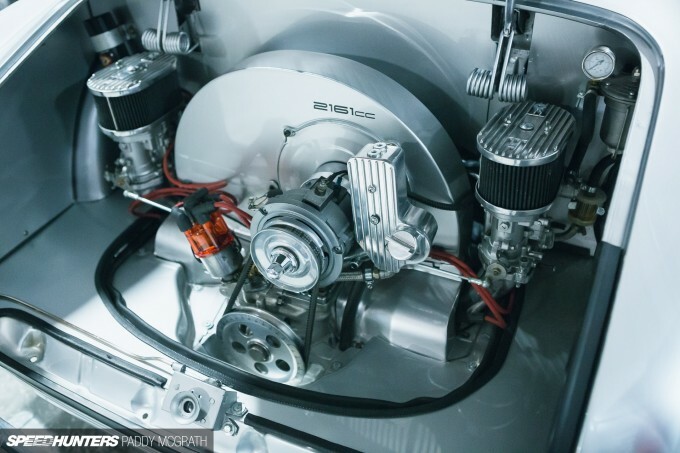 With no original engine to work with, it was the perfect opportunity for Matt to install his dream setup – that being a 2,161cc stroker motor with a raised case, twin Dell’Orto 40s and an external oil cooler. To quote Matt himself, “We just made everything bigger.” The result is a power figure of around 130hp. To achieve the desired rake associated with the Cal-Look, the rear was lowered with torsion bars and the front was narrowed and dropped. Connecting the car to the road are a set of Porsche fitment 15-inch Fuchs-style wheels. Being a ’72 model, Matt decided to make some subtle changes to the front to bring it more in line with the ’60s look he wanted to achieve. Using period correct front bumpers from an early ’60s model was one part of this, but the other was slightly more difficult. The ’72 came with rather large and unsightly amber turn signals, which wrapped around the nose. 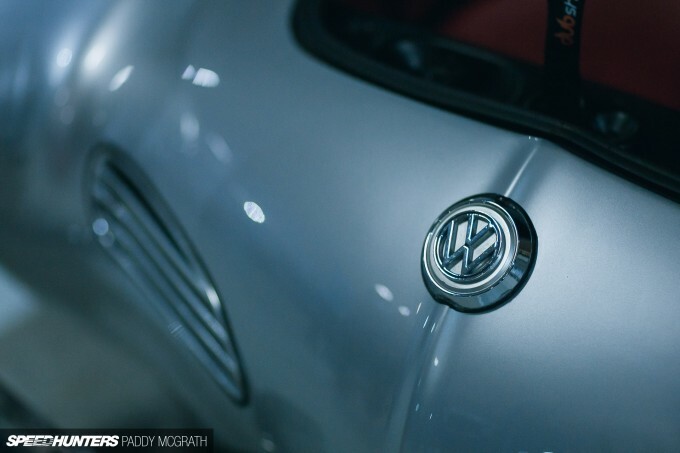 The much more discreet and round signals – as now installed beneath the main headlamp units – fetch big money on the Volkswagen global parts market, so Matt decided to make his own. 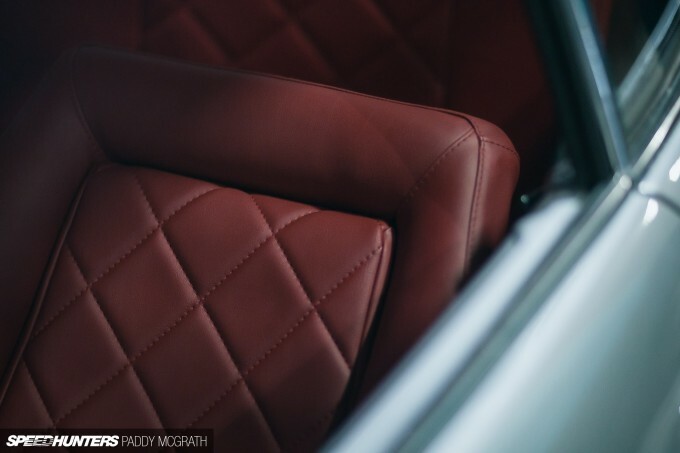 The final piece of the puzzle was the interior which was treated to the red leather that Matt had always wanted. Save for the large aftermarket tachometer and fire extinguisher, the interior retains an authentic and subtle overall look which compliments the entire build. No detail has been left to chance and this is evident wherever you look on the car. There was talk of an air suspension install, but Matt ultimately decided to stick with his static drop. 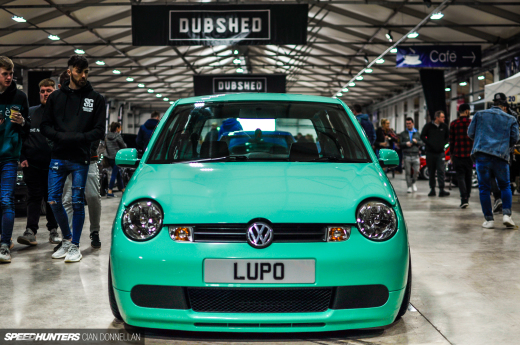 It was just one car out of many at Dubshed where the same level of detail has been applied. 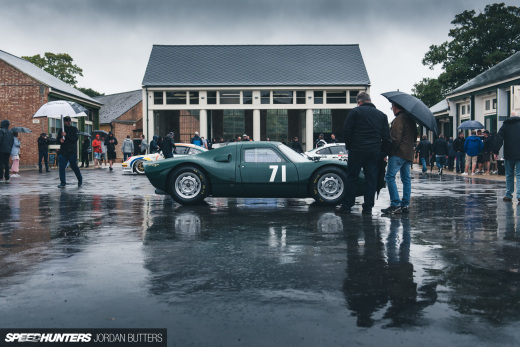 For me, this car is a lesson in patience and taking the time to make sure things are right, a quality that – admirably – so many strive to achieve within the scene. 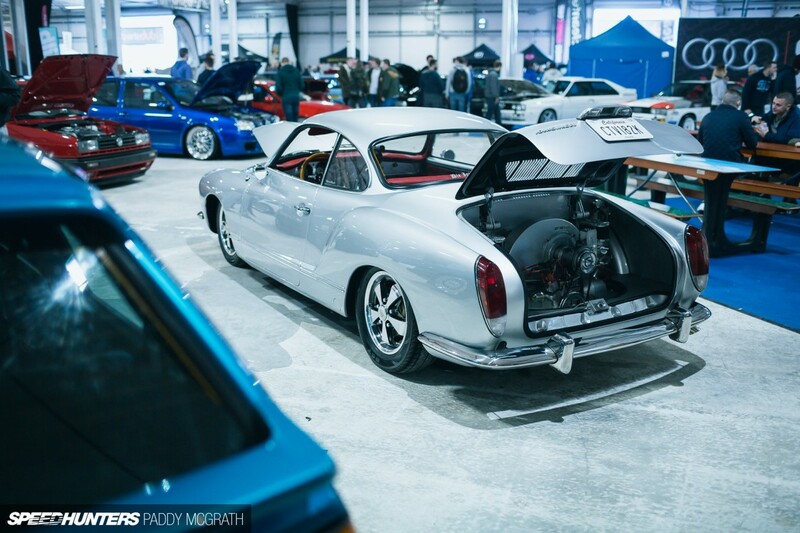 It’s also refreshing that this ’72 Karmann Ghia could park amongst a plethora of other heavily modified Volkswagens from any point over the last 30 years and still receive the same respect and attention. There aren’t many scenes or shows where old can mix with new and vice versa and not feel out of place. Dayum, you made my day with this one. 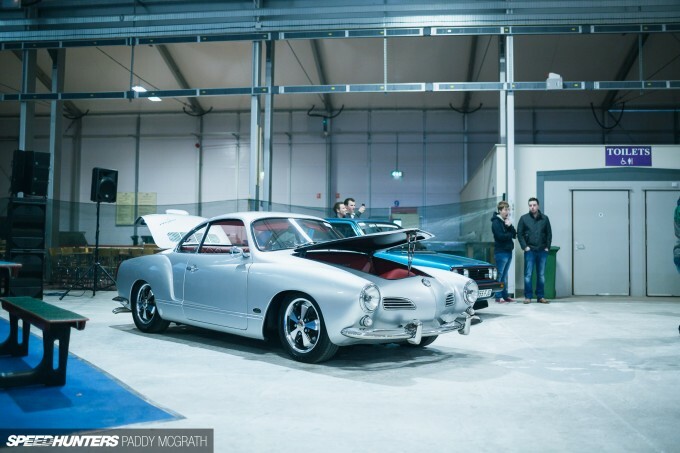 My ride is a '68 Karmann Ghia, certainly not as beautiful as this one here, but I hope it'll be one day! I've been on the fence as to sell my ghia or not. You just made it even harder to decide. Oh to not be poor. One day I will "buy a car". Im thinking NSX, S2000 or RX7, though I'm not sure I want to deal with a rotary even though I love them. Perhaps by the time I could buy a car R34s will be up for import. 20 years? That's not outrageous if you've just gotta have a particular car. It's all about the dream. That's about how long I've been designing my personal, scratchbuilt-from-the-ground-up project car, and I'm still not quite done yet. This is why air cooled is so much better than water cooled. 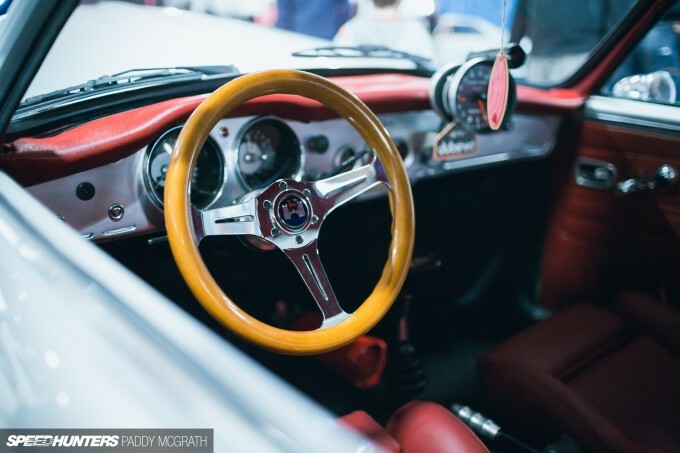 Beautiful...although I've never seen a more out of place tachometer. 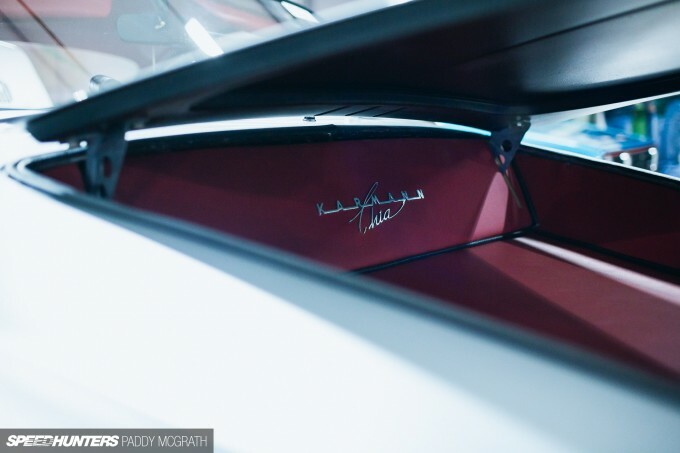 The detailing on those replica Fuchs is so wrong. Nice car otherwise mind! PlumsauceAP1 I feel like I've seen that style on quite a few Cal-Look ACVWs. A 2161 is a much less common engine size for sure but I like it. Most people go the easy route with a larger bore, but the 90.5 is thicker wall cylinder and provides better cooling than the 94. There's got to be quite a bit of clearancing for the 84mm stroke though. That video at the start is a must watch regardless of whether you like cal-look or not, great story and fantastic editing. JakWhite Look, I enjoy modern videography but still, the same techniques are being reused ad nauseum. In-focus, out-focus, destabilized, pan high to ground. Repeat. Fine for a simple three minute clip but for a 12 minute 'featurette', it needs something more. The videographer is clearly learning his/her craft, for which they get a thumbs-up. But fantastic? WIP. I'm on year 12 with this car! Ice Age For me Its been almost 3 years on Project 1 and almost a year on Project 2 which seems to be edging out P1 for my attention. No crazy camber or ground scraping air ride suspension. And that interior is on the money! Smiggins Miata? They are cheap and fun but take money to make power. Did he say how he made the paint? 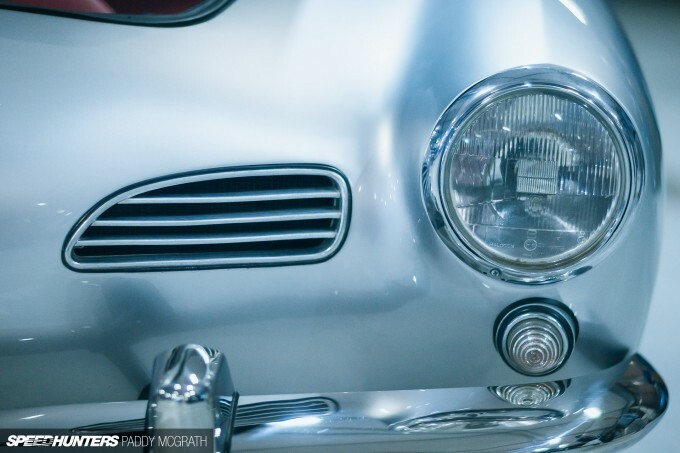 Perferct Karmann Ghia! Mental photography level! Killer post! Totally sweet ride. Designers should be more daring with their models like this was. Everything looks the same these days. The car and video is an inspiration to keep going on my own project. Thank you for the coverage. If he went to the trouble after all of these years of putting chrome bumpers and front signal lights from the 60s, the tail lights should have been changed as well. Otherwise, lovely car, great engine! squidlyness Agree! Incongruous to leave the rears. Especially too as fronts from a Typ-3 just bolt on with little modding, no need to make new ones in the old style... The tach too looks off, especially as clock replacement or fuel gauge replacement tach are available too. Pity, as otherwise it's pretty neat! I just inherited a KG that my Dad bought when I was 5. I'm going to soon take my 5 yo daughter out for her first ride in it. Then I'm going to have a friendly local KG mechanic tear out the horrendous semi-auto gearbox and put in a manual... Then the real fun begins! This article is fab inspiration; the balance that Matt has hit between slammed Cal-look and tasteful original is perfect in my eyes. "There aren’t many scenes or shows where old can mix with new and vice versa and not feel out of place." Except Goodwood, and every Dodge, Chevy, Ford, Porsche, Ferrari or Lamborghini gathering ever. 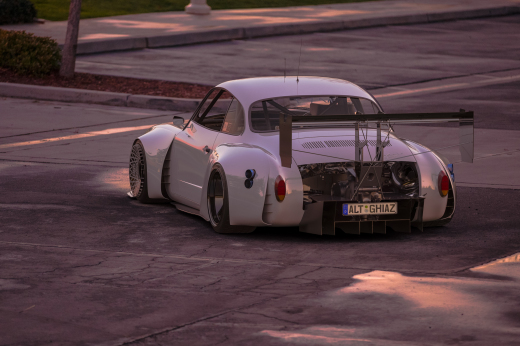 this would be a nice idea for the 67 ghia vert waiting for Squirrelly's Speed Shop entrance. After having pretty much every vw out there since the 80's, my dream was finding an early patina ghia cabriolet. So I built one over the last couple years.